If there are two cells in a house (row, column, box) where there are two candidates that appear nowhere outside these cells in the same house - those candidates must be placed in the two cells. All other candidates can therefore be eliminated from these two cells. 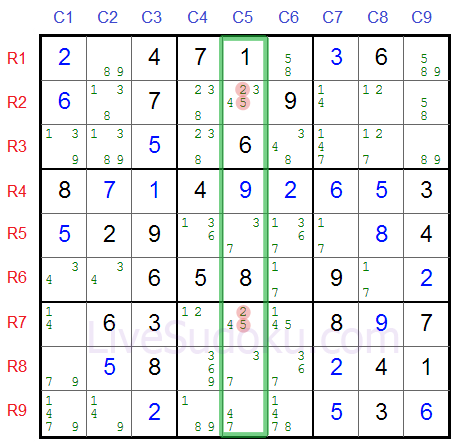 Take a look at column C5. R2C5 and R7C5 both have '2' and '5' as candidates. Also, '2' and '5' are not candidates of any other cell in this column. Therefore it is certain that R2C5 and R7C5 will be '2' and '5'. It doesn't matter which one is where at the moment. So we can eliminate all other candidates from R2C5 and R7C5. Same as with hidden pairs, triples and quadruple - you can sometimes find hidden triples and quadruples using the same logic. Hidden triples are the same as hidden pairs only with three cells and three candidates. Hidden pairs can be found using pencil marks. Once again, you don't really have to fill in pencil marks for the whole Sudoku. 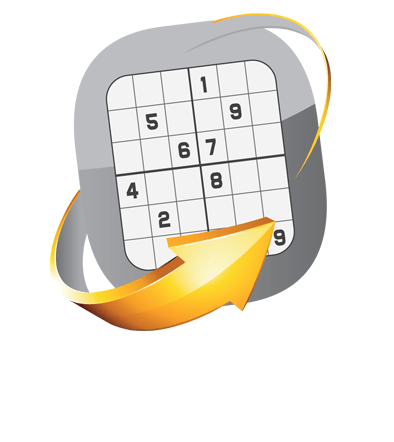 Choose columns, rows or boxes that have most of the cells already solved, fill in pencil marks and most likely you will be able to use on of the methods to get on with your puzzle.